Gestational diabetes is a diabetes type that generally develops during pregnancy. Pregnancy diabetes or gestational diabetes means that blood glucose, also known as blood sugar, is high. The body makes use of glucose of energy and if the glucose levels in the body of a pregnant woman are quite high, it might not be healthy for the mother and for the baby as well. Gestational diabetes is diagnosed during the later stages of pregnancy and immediate treatment is generally recommended for both the mother and the baby. 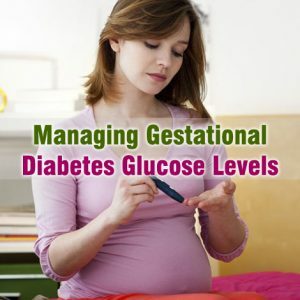 Controlling gestational diabetes glucose levels helps in protecting the baby in the womb. It is important for you to check the blood sugar levels on a regular basis as this helps in decreasing the risk of all sorts of complications arising out of gestational diabetes. It is always advisable to take the advice of a diabetes educator for learning the procedure of checking blood sugar levels and making the required adjustments. The medicines prescribed for treated the condition should be taken regularly. These medicines help in managing gestational diabetes glucose levels in the most effective manner. The best medicine for this condition is insulin that is considered 100% safe for pregnant women. Carbohydrates are very important for women suffering from gestational diabetes. Carbohydrates serve as fuel for the body of a pregnant women and even for the developing baby. It is always important for pregnant women with gestational diabetes to have different varieties of foods including fruits, dairy products, vegetables and whole grains. Proper physical activity can also be of good help in treating gestational diabetes in the most efficient manner. However, it is important for women to consult their doctors prior to trying to do so. Losing a considerable amount of weight can also help in lowering the levels of glucose in gestational diabetes. This can be done by making the choice of foods which are healthy for you and the baby as well.